Barbecue Master: Graduation Assembly Line - Why Bother? It was the big graduation weekend for my oldest son as I've mentioned. We only had 5 tickets for the graduation ceremony and 2 overflow tickets to watch the graduation on the TV in a small theatre room off to the side of where the real thing was taking place. OK. We have 20 or so out-of-town relatives in plus the ones who live around here. Some of us are automatically getting tickets like me (Mom) and the Dad person and a Grandma. The rest kind of rock, paper, scissors to share the other tickets. But, we have a big luau barbecue planned for the day after, so it's all good - or I think so. There are close 300 kids graduating, so I assume this is going to take a while. These kids go to school for 13 years and more if in a pre-K program, and they run them through in 25 minutes flat. Maybe less. Huh? How is that possible? I know I would ask how it could go that fast if I had not been there to see how they streamline the whole graduation thing these days. Color guard puts up the flags. Two kids speak like really fast - 2 minutes each or so. I didn't time. But, it was quick. No biggie. Longwinded speakers can be a bad thing at such events. Still, that's not much time to sum up an education. A school official says to hold the appluase and not to hoot and carry on. We want to honor the kids he explains and in a mannerly fashion. Then, he reads the names of the graduates. Boom. Boom. Boom. The reading is so fast that the kids can't even walk a few steps and get a diploma before the next kid or two gets called. Your kid's name is called. Lord only knows who's kid is grabbing the diploma at that moment. This is way too fast to match things up. The very first kid called had a Dad or male relative who hooted. It was like, "You go girl" or some very cliche thing yelled out. This, of course, set the stage for everyone (or some anyway) to try to outdo the first yeller. There were a few stretches with polite clapping but many party hard family groups were yelling mundane comments and drowning out the the names of the next kid or two called. I watch for my kid, but they got that line of chairs turned wrong with the last name first and the first name last. So, that back row could not get out fast enough to match up with names and diplomas. The last kid on the back row had to cross down the row over top of the other kids and no pause at all to get out and around to where the diplomas were sitting. Things were already backed up but even worse there at the end. We heard our kid's name called, at least, as he did not follow a major yelling family. We kind of saw him maybe. I don't know. We clapped for some fine young man - ours or another. Hard to tell. The whole thing was done - boom like that. Folks started filing out. The police were there and saying, "Move it on. Clear the lobby." They looked like SWAT police with pants tucked in the boots. Everyone tried to smash out the doors and hoped for no cattle prods or tazers. Lord help the old, infirm or the hard of hearing. This was serious business. "Get out and do it fast. Move it. Get on out." Our family got on out pretty quick as we did not have any infirm - at least who came. And, we even found the graduating kid in the parking lot for a couple of fast photos. Smile. Click. Let's get on out of here before we get arrested for some random thing. The cops seem most intent on clearing the crowd even though the car line out of the parking lot was at a dead standstill. 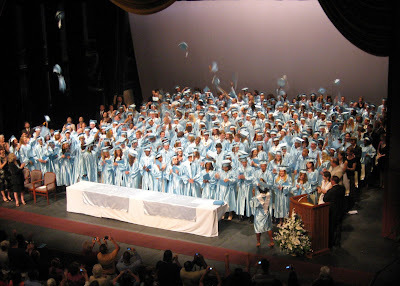 Frankly I think they ought to just mail the diplomas or have all the grads stand up en mass and just say, "Here is the class of 2008. Clap. Yell. Get lost. We can't be bothered to make this thing special, so don't get your hopes up." They did not even mention honor grads at graduation. They did have them stand up first thing and ask us to clap. As they were called up, nope. Just the names. Move it on. Who really cares about grades? Who cares about having worked extra hard in high school? Good thing we had the barbecue scheduled for the next day for all those who could not get tickets and those who did and got a 25 minute assembly line. Seating started one hour prior - more than twice as long as the ceremony. Glad we did not go and stand in line for ages on top of the ceremony that was a real let down. They were selling DVDs of this graduation mess. I was going to get one, since my Mom (grandmother of the graduate) got sick and was in the hospital. I just told her that she really didn't miss anything. And, she didn't. I don't know how they could make a special day any less special. They sure charged a heck of a lot for all the graduation frills and then had the most awful celebration I've ever seen. Really now, they should have paid folks to come to this train wreck. I can't imagine that any kid felt honored or that any family member with a ticket to get in was glad. The lucky ones were the ones who did not score a spot on that list of five guests. I'm still thinking, "How the heck do you honor almost 300 kids in under less a half an hour?" You don't. They didn't. Why bother? We should have cranked up the grill on Friday night and skipped that stupid graduation. I can't think of one good thing to say about it, and I did try. If they can't do any better than that, they ought to just forget it. I'll try to forget. But, it's hard to forget something that bad.Thumbs down on the graduation ceremony - but the barbecue turned out great. Congratulations to you and Caleb! Thanks! I'm real proud of him.